Monitor files and folders for size, count, modification, existence, and more. 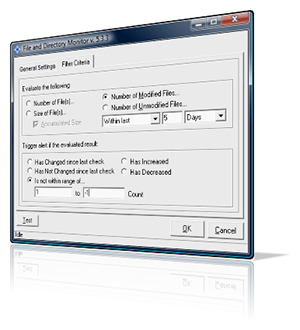 The ipSentry File and Directory monitoring add-in provides ipSentry with file and directory scanning and monitoring of various aspects of file information such as file existence, size, total directory size, directory tree size, file counts, new file counts, modified files, and unmodified files and folders. The add-in can monitor file and directory information on local drives, network shares, and FTP servers. Perform scans on files and folders to check for existence, changes in size, modifications, file additions or file deletions, scan single folders or an entire directory tree. Check to make sure log files are being updated, directories are being cleaned out, queue folders are not growing out of control, and that things are functioning. In some cases, the only way to tell if a process or application is actually doing it's job is detect changes in specific files or folders. This add-in does that and much more. This little tool solves a lot of problems that just can't be solved any other way.